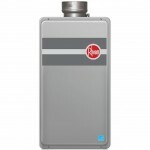 The most important factor when deciding which tankless water heater to purchase is based on the number of fixtures you need to get heated water to and the amount of water to heat. It is not uncommon for a homeowner to purchase the tankless unit that seems correct for their application to find that they miscalculated. 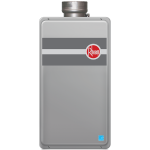 We always recommend purchasing a tankless unit with redundancy in output; therefore you will never have an issue with lack of hot water. Most ratings from the manufacturer do not take into account your unique plumbing situation, so consulting a professional is recommended. Power Type: Electrical, Natural Gas, Liquid Propane. 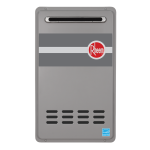 Depending on your house utility configuration, you can connect a tankless unit to any of the following power sources, however, you must consider that an electrical tankless unit will not work in Natural gas applications or Propane, and vice versa. 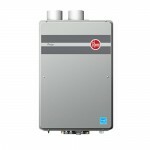 For Electric Tankless Heating Units, your amperage and voltage are very important. Your breaker size may be too small, or may need to be upgraded to accommodate the new heater. If this is the case, upgrade to a breaker that will have some redundancy in power rating. How far your tankless heating unit will be installed from your fixtures. 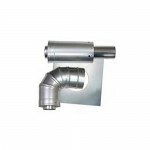 If your heater is too far from your shower, or faucets, they will either get a reduced flow of water, or a lack of heat. This is caused by the added traveling distance the water must travel through your pipes. If this is a concern for you, consult our staff for expert advice, or consult the installer for recommendations. Whole house or Point of Use. 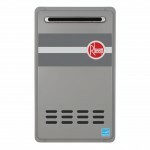 Point of use tankless units only operates with a single fixture at the point of use. 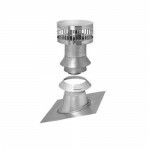 Some point of use models can work with extension kits to expand usage to multiple fixtures. 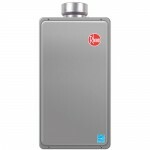 Whereas whole house tankless units are designed for larger volumes and will provide heated water to all fixtures in your household. Once again, it is important to take redundancy into account with Whole house heaters to make sure each fixture has steady, warm flow. For additional assistance, or for expert advice, contact our Customer Service Department through Live Chat or by telephoning 1 (877) 998-9378. 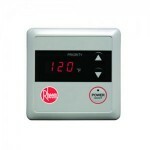 Westside Wholesale offers innovative water heating solutions from Rheem. This reliable manufacturer creates highly efficient appliances with a lot of new technological innovations paying particular attention to today's home needs. 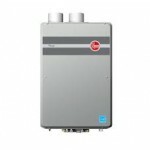 This manufacturer has all kinds of tankless water heaters from point of use applications to whole house systems. Rheem created water heating solution to fit any needs. These appliances provide a continuous supply of hot water and all models are concentrated on being energy efficient. Moreover, Rheem knows that some have little space for such appliances so engineers worked hard to create a space saving heater that can be installed anywhere. 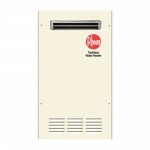 Rheem tankless heaters product instant hot water while also reducing energy costs. Now, it is possible to load the laundry, turn on the dishwasher, and bathe simultaneously. Additional benefits include LED lights to indicate the active element and standby mode. 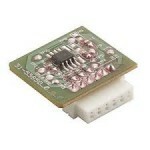 These products are acknowledged in the professional sphere as well. 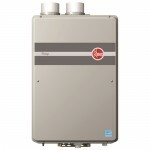 Rheem Tankless Water Heaters have been acknowledged as one of the Top Green Products in Building Products Top 100. This rating identifies new products that are used by building professionals. 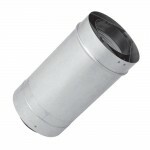 At Westside Wholesale we these products at unbelievable discounts.